Use Search term "Design By Nature" in the Google maps to find us. past about 10 houses, keep going into the forestry zone, avoid lanes and farm entrances. with Large Barn with windows and steel door....If you get to the 4 cross roads (with yield signs) you have just past us. If the weather is fine you will see the windmill farm. we can grow cool temperate plants out of season to extend the planting season. At the junction of N78 and R431, (Accident Black Spot) that is Crettyard. 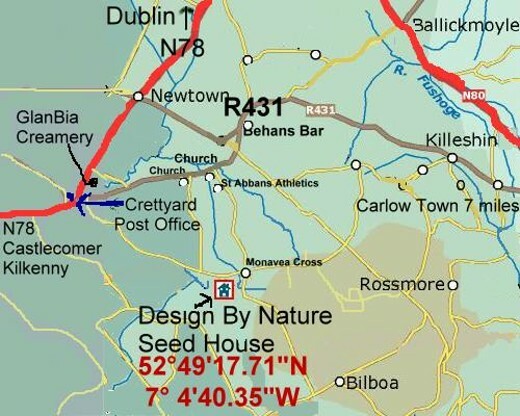 At Crettyard Post office in Crettyard turn on to R431 to Carlow and take the very first right turn after 5 bungalows on right, take 1st right turn, (L3899) go up hill for 2.4 miles, past about 10 houses, keep going into the forestry zone, avoid lanes and farm entrances. In amongst the forest trees, there are two houses on right, were the second one, right on the road, a stone cottage, with Large Barn with windows and steel door....If you get to the 4 cross roads (with yield signs) you have just past us. If the weather is fine you will see the windmill farm.